Wild hogs, also known as wild boars or feral pigs, are smart, ferocious animals who can grow up to 400lb in size. Hog hunting is a popular American pass time and sees the elimination of thousands of these animals each year. This helps keep their population in check. Anyone with a valid hunting license can enjoy this activity all year round on both private and public hunting grounds. Want to know more about it? Here is everything you need to know before you saunter off into the night after these animals. The great American outdoors is home to many a wild creature, the wild hog making up a large number of them. It is estimated that 6 million of these animals roam the US soil at any given time. They move in packs and breed often while on the move, rarely ever settling in what we would identify as a home base. Sometimes referred to as a “plague of pigs”, the overpopulation of these creatures in the United States is a challenge people who manage their own land or farm. Residents resort to a variety of hunting and trapping techniques in order to lower their numbers. But the hogs are resilient creatures. They can survive in almost any climate or terrain and are known as “opportunistic omnivores” meaning they will eat whatever they can find to survive. The pigs are notorious for destroying (or rather consuming) crops of hardworking farmers. They are also said to spread a variety of diseases ranging from the bacterial swine brucellosis to salmonellosis and foot rot. It is largely because of these reasons that the popularity for hunting these creatures has seen a consistent rise over the years. Hogs are caught and killed and, if good enough, used for meat & other leather-based products in many communities. Some hunters actually use hog hunting as their sole form of income. They harvest the meat and leather & sell it off to butchers and manufacturers. The vast landscapes of these states are perfect habitats for wild hogs. The hogs, however, are not limited to any specific region and can be found across 36 of the neighboring states as well. Hog hunting is a social activity and is usually done in a group involving family or friends. Since it is illegal to use poison on the animals in order to kill them, hunters must use hands on hunting and trapping practices to get the job done. Snares are a common way of rounding up a hogs on the loose. While hunting by day is perfectly common and yields equally as successful results, hunting hogs by night is preferable for most hunters. The darkness gives the hunter the edge, cloaking him or her from direct view and adding the element of surprise when approaching the hogs. The hogs usually don’t know what hit ‘em! Hunters make use of heat sensitive goggles and various sensory devices to track & kill the pigs once darkness falls. The advanced technology behind these devices allows hunters to make kills even if there are long distances between them and the pigs. As bonus - newer thermal scopes and monoculars can even play back the video footage for research or to share memories with friends afterwards! Basic safety during hog hunting involves maintaining a safe following distance when tracking or approaching a group of hogs. Not only will this keep you undetected for longer, but it will also keep you in a safe zone while in unfamiliar territory. While hogs will usually not attack unless provoked, they are notoriously aggressive and territorial creatures. Getting too close for comfort will probably put you in harm’s way. They have invasive, opportunistic natures that make their next moves distinctly hard to predict. What’s more, wild hogs carry and spread numerous diseases. Coming into direct contact with one could put you at risk of contraction. Therefore, you don’t want them storming at you or biting you when you’re not prepared such as wearing gloves before touching one. Unless you fancy being hunted yourself, always keep a safe following distance. As a beginner it is imperative you familiarize yourself with the tools required by any hog hunter. This is the beginning to be adequately prepared when out in the field. Remember - the quality of your equipment could mean the difference between a safe hunt and an extremely dangerous hunt. The choice is yours. The first and most important piece of equipment is the type of firearm one chooses. Typically hog hunting calls for the use of semi-automatic rifles. This type of rifle has good accuracy and pack enough punch to bring a full-grown hog down in one shot and when more than one shot is needed multiple shots can be taken in quick succession unlike with a bolt action rifle. There is some ongoing debate amongst hunters as to which rifle really is the best for the job. Some more skilled huntsmen believe that any old firearm can do the trick if you have the “right eye”. Others argue that night hunting calls for a semi-automatic a rifle and consider anything less a waste of time. These used to be utilized solely for domestic feeding purposes. However, they proved exceedingly useful in recent years in aiding hunters during a night of wild hog spotting. A simple way to put it - wild hogs think with their stomachs. Their lives revolve around food. Put food out and they will come. Hog feeders are generally large metal drums that can be filled with food and accessed through opening flaps at the bottom. 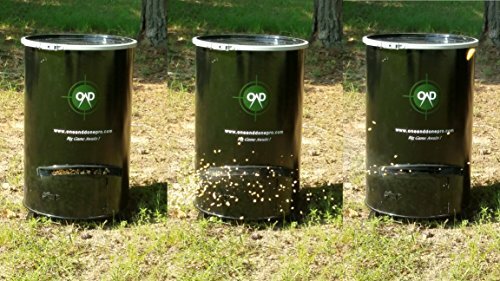 You can find them online and the One and Done Game Feeder is a popular 5 gallon option. Modern technology has seen a rise in popularity of what’s known to those in the hunting industry as “the green light”. It’s another device to make closing the kill that much easier. 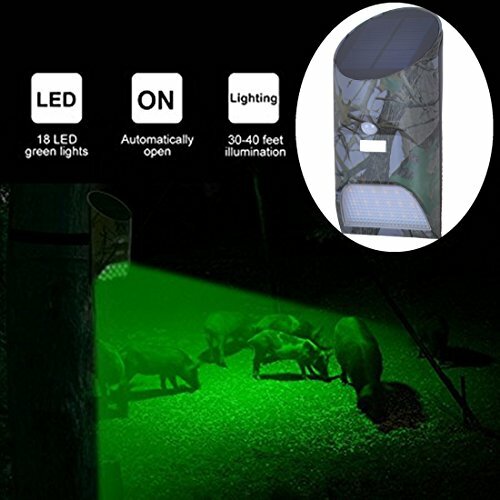 A green light is an adapter that can be fitted to a feeder which will illuminate a non-threatening green glow when a hog is in the vicinity of the feeding drum. 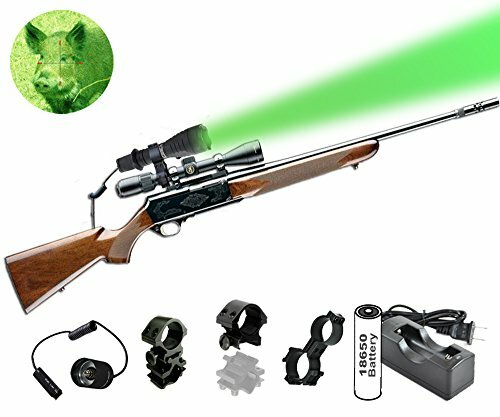 This is a helpful and highly recommended piece of equipment especially for newbie hunters who haven’t had much experience in night hunting of wild boars. Green lights are typically inexpensive devices. Lilbees offers an affordable one that you can easily attach to your feeder. Want to know more about hog hunting equipment. These reviews will help you gear up for your first expedition. The Odepro light kit is a specialized hunting flashlight that features a choice of four colors that are easy to switch between as targets change. The light is noticeably brighter than its competitors and easily clips on & off a rifle. Clip on flashlights are recommended as the light of choice for the serious huntsman. The experience of going hands free and being able to have both hands on your rifle - not having to worry about a light - is invaluable. No one wants to have to fumble between their gun and their flashlight in the middle of making a kill. It is waterproof and can be used to hunt in the rain & fog. The aluminum body allows it to withstand even the harshest of environments when out on the hunt. The device is lightweight and easy to transport. It runs off two batteries that can be recharged after each hunt. It is advertised that this can be done over 500 times before the batteries need to be replaced. Odepro prides itself on the fact that none of its buttons or components make any noise at all when in use, which is valuable to the serious hunter. Much more affordable than the previously mentioned spotlight, this Ulako light features a single green light and only one mode of function when in use. While also waterproof and shock resistant its battery life is significantly shorter when compared to the Odepro as it uses a single battery. Thankfully this inexpensive light also features the clip-to-rifle option allowing for hands free hunting. 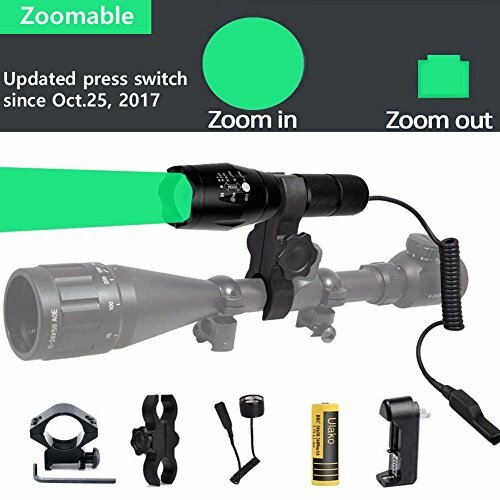 Unfortunately, its lack of zoom feature means it can only illuminate 500 yards ahead of you. This light would be ideal for the more compact hunter that isn’t interested in lugging around bulky equipment. If you’re happy to make do without all the bells and whistles that more expensive units will include, this will suffice. At the end of the day; if you need a spotlight, this is a spotlight. As basic as they come. Self-proclaimed “best hog hunting light on the market”, this little device packs quite the punch when all things are considered. It is the smallest of the featured spotlights and neatly clips right onto your firearm for that hands-free experience we love so much. It operates on four setting options and because of its size maintains extended battery life even though it is running off a single cell. However, one must take into consideration this little guy only illuminates up to 273 yards. The Orion flashlight operates in either red or green, the two hardest colors for hogs to detect. It is usually recommended that hog hunters make use of green only and that coyote hunters make use of the red. In terms of value for money, unless size is the deciding factor this isn’t the perfect pick. For the same price they could afford the Odepro with its vast range of features. But from a “will it get the job done?” point of view - yes, yes it will. Taking down a hog target in the night involves more than just a persuasive feeder and loaded gun. 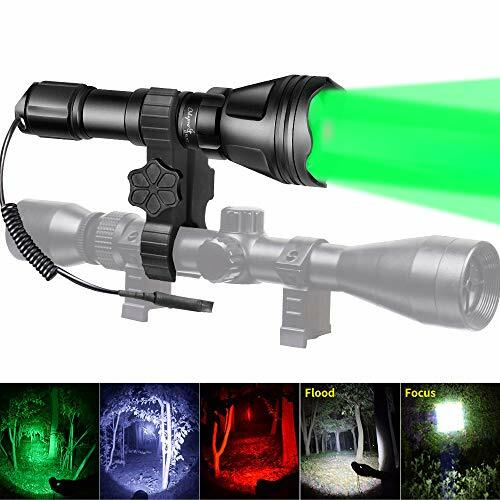 Thermal optics are like giving sight to the blind and will give you the upper hand on these night sensitive creatures as they move through the land. Again, budget and personal preference must come into play when choosing your night eyes. The Thermosight Pro is entirely digital and operates in HD quality for consistent, clear visuals both in low light during the day & full darkness of the night. The unit is as effective in haze or smog as it would be in perfect weather conditions. The PTS 233 also makes use of FLIR’s newest 12-micron Boson thermal which is more advanced than most other thermal scopes on the market. This new thermal core allows it to be smaller and lighter as well as have longer battery life than other scopes. Its state of the art sensors and video processor work together to collaborate heat sensitive visuals. You get both real time and recorded footage for easy playback. A built-in digital compass adds target accuracy and provides precise range of field. The color palette is also fully adjustable to one’s personal preference making what catches the eye a customized experience. When fully charged the system will stay on for a period of four hours before it needs to be recharged or have new batteries put in. This can be done quite easily in the field. During this time the user can record up to two and a half hours of video footage or 1000 still images. Its recording is also shot activated meaning that you don’t have to worry about pushing the record button before taking your shot. It clips neatly onto almost any rifle which means syncing it into your target zone is quick and easy. It will always be viewing what you’re viewing. The Pulsar’s claim to fame is its ultra-magnifying ability over large distances in the field. It is able to detect heat and movement up to almost 2000 yards away. This makes your anonymity almost guaranteed when approaching a potential target. Waterproof, dust proof, fog proof, this has it all. It’s able to function anywhere from -12°F to 122°F. 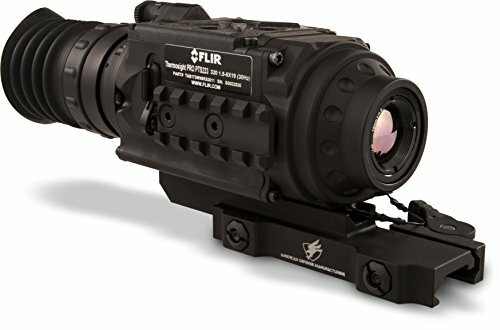 The Pulsar also offers users video recording function, however cannot hold nearly as much footage as the afore mentioned FLIR unit. The batteries last an impressive eight hours at full charge, which is preferable on a night hunt. What’s more, the Pulsar Trail XQ can connect to any Android or iOS cellphone or tablet offering live feed and streaming of all visuals coming from the field. The app can also connect this feed to social media platforms where others can access and view the events of the hunt as they unfold. With an impressive 18 hours of continuous operation until it needs to be recharged, the Thor is not a unit to be overlooked. It offers heightened sensitivity as well as a ballistics calculator that solely helps close the shot each and every time. The system will calculate distance, wind speed and trajectory. It takes into consideration things such as air temperature and humidity so that your ballistic feedback is as accurate as possible. You get an optional clip-on laser range finder for longer distances and a remote control that gives the user access to the entire system even when it is not physically in reach. Therefore, it’s no question that this is a unit worth seriously considering. The thermal imagery itself is state of the art. Clear, crisp imagery makes it easy to identify targets and objects when in the field at night. It is also equipped with the standard video recording feature and the ability to stream the visuals to a SmartPhone or tablet. Its auto shut off function ensures no memory is wasted as the unit syncs with the mechanics of your rifle and will automatically record before and after each shot. 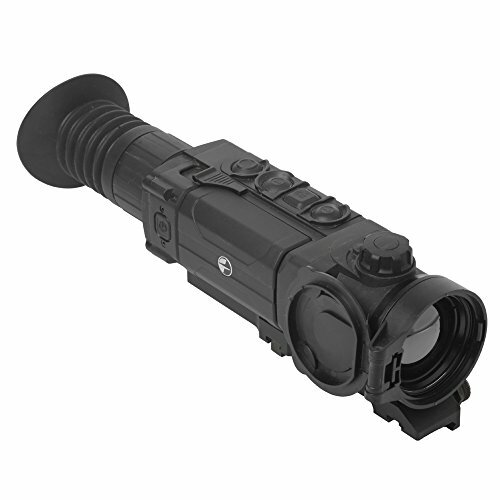 Thermal optics devices are typically all within the same price range, give or take a few dollars. How many accessories you add to your purchase will determine the final cost. The real deciding factor when purchasing one of these gadgets will be what you, as a hunter, deem most necessary and valuable to your experience out in the field. In some ways similar and in some ways very different to thermal scopes; thermal monoculars are perhaps most easily described as: A simpler, less complex version of the previously mentioned scopes. A thermal monocular is a small telescope shaped eye piece that is used to spot hogs or other animals and their body heat yards away. Let’s look at some of the best in the industry. This monocular by Pulsar features manual, automatic and semi-automatic mode options. 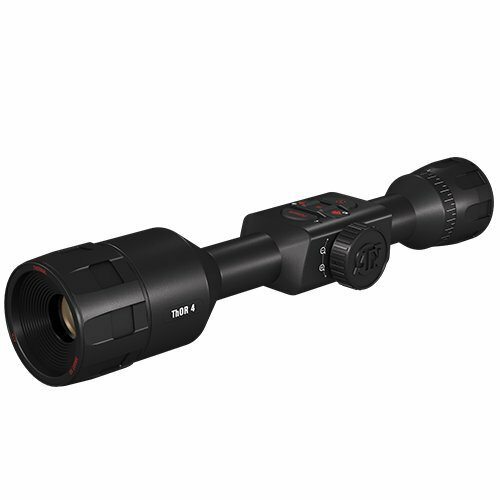 It is arguably the best thermal monocular on the market for hog spotting in the hunting field. While the device is video compatible, it is more of an in the moment type device intended for quick and easy detection of hogs in a suspected area. Its scope offers a high resolution and makes attempting a shot at targets extremely accurate. The device’s appeal lies in its two second start up time, which is incredibly fast when compared to other heat sensing devices that require far more effort. It shuts down just as quickly and automatically, when not in use which stretches the battery life considerably. 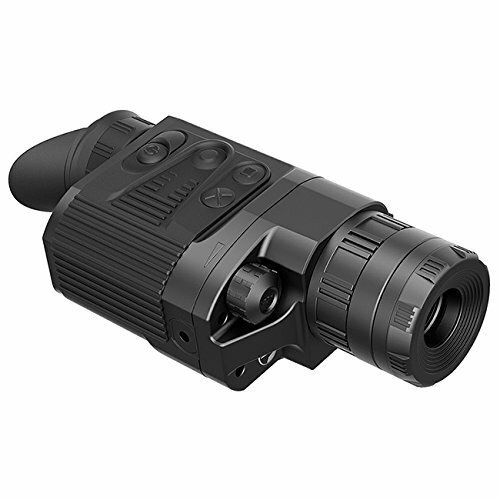 As a beginner in the activity of hunting hogs by night, a thermal monocular is an affordable yet equally as effective spotting device. Use it in the interim while you figure out if hog hunting is a sport which you’d like to invest in more expensive, high end equipment for. Hunting by night is not for the faint hearted. It takes a lot more than just skill and being in the ‘right place right time’ kind of luck. Becoming an active and successful wild hog hunter requires equipping yourself with at least a hand full of the gadgets mentioned above. This is not only important to ensure the overall success of your hunt but also your personal safety while out in the field. Thankfully, the widespread popularity of this sport and the ever-increasing population of wild boars count in your favor. It’s an easy topic to gain insight and educate oneself on before actually entering the field. Handy tip: Take time to familiarize yourself with the terrain you will be hunting on. Learning it by day will make navigating it by night that much easier. Make it equally as important to familiarize yourself with each and every piece of equipment you end up purchasing. Know them like the back of your hand. Any successful hunter will tell you that there is little skill involved in making a solid kill. What it comes down to at the end of the day is the equipment you prepare with and the comfort and knowledge in executing with your equipment. This is good news for anyone who is just starting out in this tactical sport; practice will make perfect.